Katrina Ringrose is the Program Director of Children’s Advocacy at Disability Rights Maine (DRM). She oversees the delivery of advocacy services to Maine’s children with disabilities by providing guidance and support to a team of attorneys and advocates. Under Katrina’s leadership, the children’s advocacy team conducts outreach, monitoring, and individual and systemic case work to protect the rights of hundreds of children each year. Since joining DRM in 2006, Katrina has held a variety of roles. For years, she advocated for youth who were not receiving an appropriate education or inpatient or community treatment. In 2012, Katrina led the transition of DRM’s newly-formed Developmental Service Advocacy (DSA) Program, which provides advocacy services to adults with Autism and Intellectual Disabilities. Katrina is a graduate of the University of Maine at Augusta, where she earned her B.S. in Mental Health and Human Services. 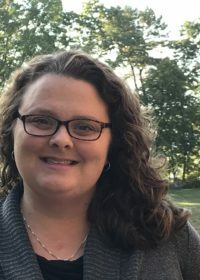 Katrina has developed and provided trainings on a wide variety of disability and advocacy topics, and trains audiences throughout Maine and beyond. In June 2018, Katrina co-led a special education training at the National Disability Rights Network annual conference in Baltimore, Maryland.